The Cascade Range is an arc of volcanoes that extends from southwestern British Columbia to northern California. 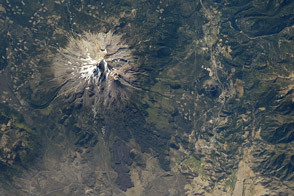 One of the six major composite volcanoes (formed by alternating layers of extruded lava and compacted ash) is Mount Baker in northern Washington. Close to the Canadian border, Mount Baker is about 85 miles north-northeast of Seattle and 65 miles southeast of Vancouver, British Columbia. This beautiful, snow-capped peak dominates the skyline from Bellingham, Washington to Vancouver, and offers multiple recreational opportunities to visitors and locals alike. The life-threatening and destructive hazards of composite volcanoes include their tephra (ejected ash and rocks), lava flows, lahars (a mudslide composed of volcanic ash and debris saturated with water, often from glacial melt), and debris avalanches. Modern Mount Baker itself is a relatively young volcano (10,000-30,000 years old), but no eruptions have been observed since the mid-1800s. 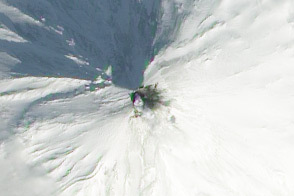 However, a steam plume is often observed from Sherman Crater at the summit (10,778 feet), occasionally alarming local residents. A marked increase in plume activity accompanied by unusual snowmelt led to the temporary closure of Baker Lake by the National Park Service in 1975. 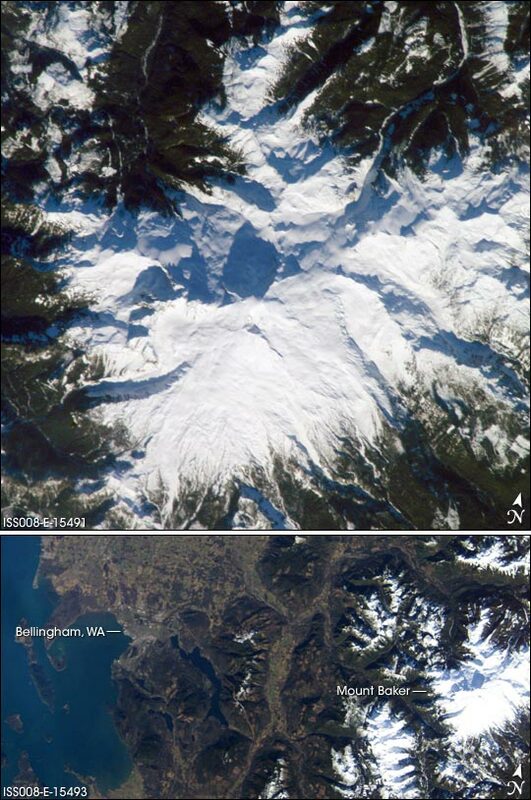 These two photographs were taken from the International Space Station. The high-resolution image provides details of the rough terrain near the summit and on the upper flanks. 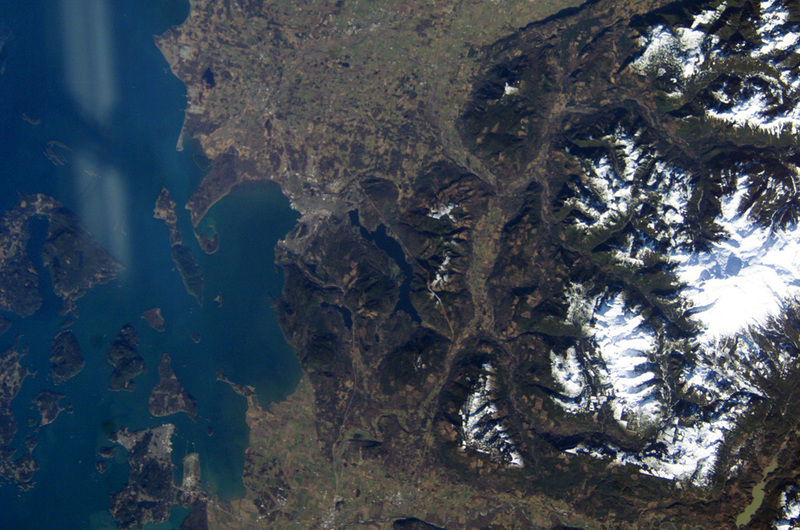 The lower view provides a regional picture of Mount Baker, showing its proximity to Bellingham. Astronaut photographs ISS008-E-15491 and ISS008-E-15493 and were acquired February 12, 2004, with a Kodak DCS760 digital camera equipped with 80- and 400-mm lenses (respectively), and are provided by the Earth Observations Laboratory, Johnson Space Center. The International Space Station Program supports the laboratory to help astronauts take pictures of Earth that will be of the greatest value to scientists and the public, and to make those images freely available on the Internet. Additional images taken by astronauts and cosmonauts can be viewed at the NASA/JSC Gateway to Astronaut Photography of Earth. The Cascade Range is an arc of volcanoes that extends from southwestern British Columbia to northern California. 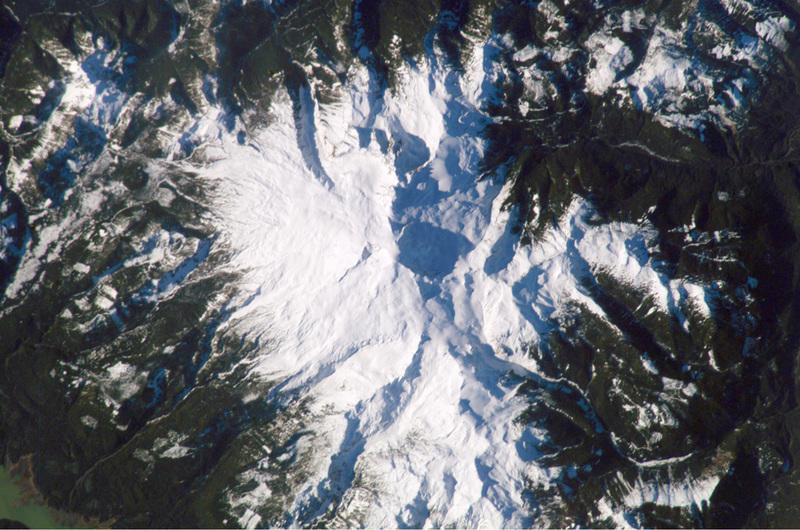 One of the six major composite volcanoes (formed by alternating layers of extruded lava and compacted ash) is Mount Baker in northern Washington.